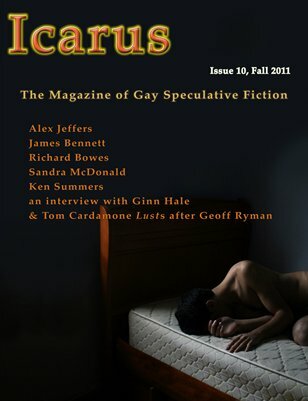 Icarus: The Magazine of Gay Speculative Fiction presents stories and features for Fall 2011. A fairy boy confronts a human crush in Alex Jeffers's "Liam and the Ordinary Boy." James Bennett tells a tale of death and art and Michaelangelo's favorite apprentice. Award-winning author Richard Bowes offers another jewel of a tale that begins when a writer meets a devoted fan at an event. Sandra McDonald tells of a mindful puss. Ken Summers, author of a collection of true queer ghost stories investigates a new haunting. Plus, this issue has reviews, gossips, an interview with Ginn Hale and the debut of a new column by Tom Cardamone, who reveals his "Lust" for the talented Geoff Ryman.